We often hear about the 'first man on the moon', but rarely do we hear about the woman who made it all possible. It was the 1960's, a time where women were not generally encouraged to seek out high-powered work, especially not work that was usually done by men. Margaret Hamilton, a 24 year-old mother with an undergrad degree in mathematics, working at MIT, had planned to support her husband through Harvard Law. After that, she would work on her own graduate degree. And that's when the Apollo Space program came along at MIT, which would ultimately find her in a position to lead one of the biggest feats of humankind. During this time, programming was considered 'women's work' - Keypunching, much like typing, was demanding work and the women were given requirements from their seniors, however they often designed the method and set up the calculations themselves. This meant that many of the earliest programmers were women, pioneers in programming. At the time, computer science and software engineering were not disciplines: "...nobody knew what it was that we were doing. It was like the Wild West. There was no course in it. They didn’t teach it.” The term 'software engineering' was in fact a term coined by Margaret, something that may surprise many in today's male dominated technology industry. Margaret and her colleagues were inventing important ideas in computer programming and she quickly became an expert in systems programming. In the early days of the Apollo program, software was not in the schedule and not even in the budget, but as the research continued, it became clear that software would be crucial to accomplishing the mission. In 1965, Margaret became responsible for the on-board flight software on the Apollo computers: a vital role upon which the US was depending. The lunar landing was the first time that software had ever been entrusted as such an integral part of a mission. On July 20th 1969, Neil Armstrong took humankind's first steps on the moon. 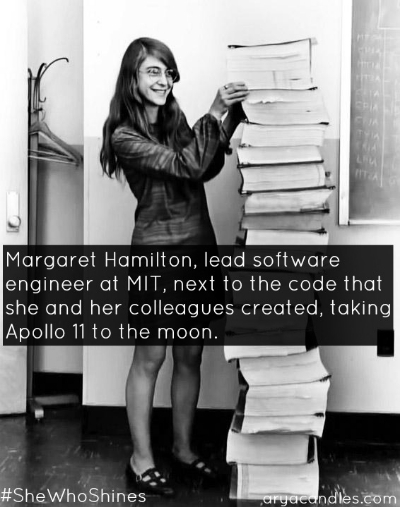 Margaret Hamilton had been the woman who led the effort to build Apollo 11's on-board fight software at MIT, along with NASA. "I remember thinking, Oh my God, it worked. I was so happy. But I was more happy about it working than about the fact that we landed." Margaret was later given NASA's Exceptional Space Act Award. Margaret has said that she was so focused on her work, she didn't really notice gender issues at the time. She was a woman who was treated with respect by her peers, for her determination and intelligence. However, she recalls that a female colleague of hers wasn't able to get a loan from the MIT credit union without her husbands signature. Margaret complained about the policy, and had it changed. "I didn't do it because of male versus female; I was very conscious of what was fair and what wasn't fair." Stay tuned for the stories of 8 more incredible women, and at the end of this week we'll be opening the votes to find out whose story you find the most inspiring. The 3 women with the highest amount of votes will have their names beautifully etched on our Limited Edition white candles for International Women's Day. Get involved on Facebook and Twitter by using the hashtag #SheWhoShines and sharing this post, or telling us about who inspires you.